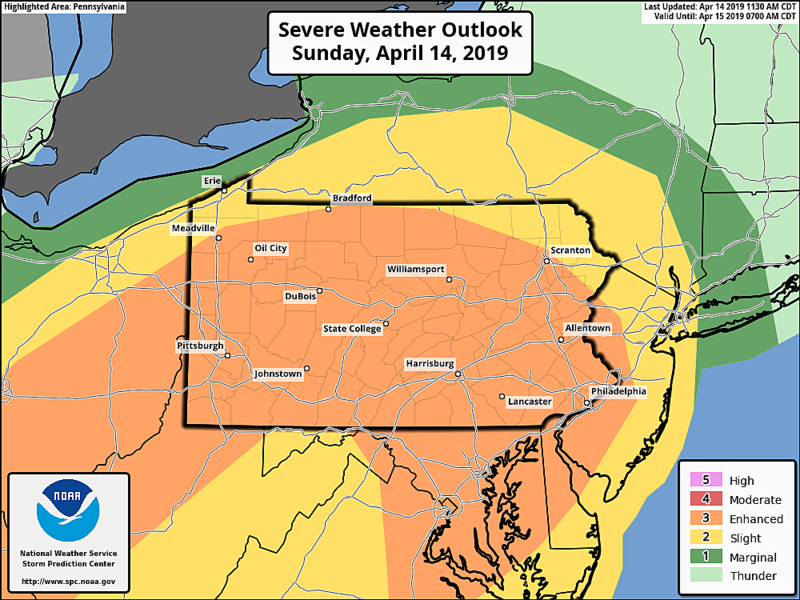 Tonight's squall line is looking even stormier, and the latest Severe Weather Outlook from the Storm Prediction Center upgrades part of New Jersey to an "enhanced" risk of severe weather. What does the upgrade from the yellow to the orange area for western NJ mean? 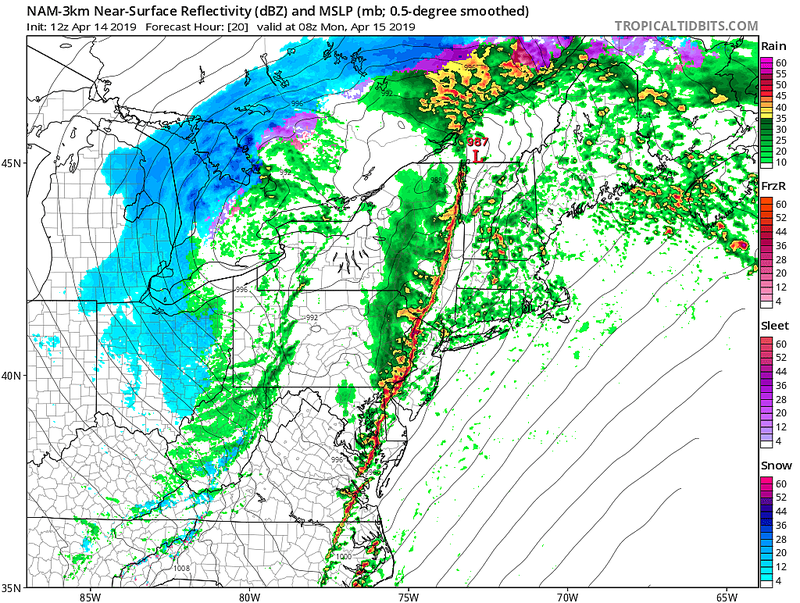 The chance for damaging winds (60+ mph) specifically is going up, because of the dynamics of our impending storm system (a sharply defined squall line) and the humid soupiness of today's atmosphere. When tonight's line of thunderstorms crashes across the Delaware River (technically early tomorrow morning), you're going to know it! A sturdy building is absolutely the safest place to be while these storms are rolling through. Ahhh, what a weekend! Saturday was splendid — humid and unseasonably warm (away from the coast), with plentiful peeks of sunshine. We started Sunday with fog, but the rest of the day looks fine. However, the warmth and humidity will become energy and moisture for an approaching storm system. And we are going to start the new workweek with a set of loud, potentially dangerous thunderstorms rumbling through New Jersey. As of this writing, dense fog has burned off for all but the Jersey Shore. Temperatures will make a run for 70 degrees Sunday afternoon, especially in the southwestern corner of the state. While Sunday will be a less "spectacular" spring day than Saturday due to extra clouds and slightly cooler temperatures, it does look generally quite present. 1.) A few spot showers will be possible at any time Sunday morning or afternoon. Very isolated, and probably just a dribble of raindrops. 2.) A round of scattered showers and thunderstorms will swipe past western and northern New Jersey between about 5 p.m. and Midnight. There will likely be pockets of heavier, steadier rain and perhaps a few stronger storm cells, anywhere away from the coast. 3) A squall line of strong to severe thunderstorms will be our grand finale from 3 a.m. to 8 a.m. Monday. That's when we'll have the possibility of damaging winds and truly torrential rain. 1.) Heavy rain, at least for a brief time, is pretty much a guarantee. The torrential downpours may be too brief to cause widespread flooding, but "big puddle" may still cause problems on New Jersey's roadways leading up to the Monday morning commute. 2.) Damaging winds are common in a "linear" thunderstorm setup like this one. There's a good possibility of a burst of 60+ mph winds just ahead of these storms, which could be enough to down trees and power lines, cause driving difficulties, and turn lawn furniture and trash cans into projectiles. Luckily, the vast majority of New Jerseyans will be asleep in bed during the worst of the potential storms. 3.) Lightning, by definition, is present in every thunderstorm and therefore potentially dangerous in every thunderstorm. An isolated lightning strike could spark a fire or power overload. But once again, there won't be a lot of people outside working, golfing, galavanting, etc. A sturdy building is the best place to be during a thunderstorm. Honestly, the biggest impact will be a lot of New Jerseyans getting an abrupt early morning wakeup from the loud booming storms. I'm also somewhat concerned about lingering storms and/or impacts into the Monday morning rush hour. If warnings for an imminent tornado, severe thunderstorm, or flash flood are issued, don't be surprised if it activates a Wireless Emergency Alert (WEA) on your cell phone. Of course, we'll have regular updates on-air and via social media during any inclement or potentially dangerous weather.